Santa Monica Press, 9781595800503, 235pp. 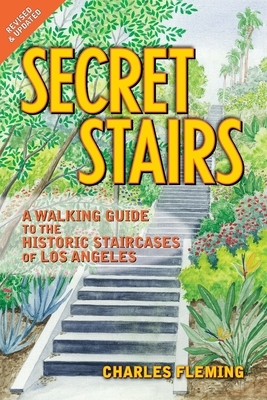 Containing walks and detailed maps from throughout the city, "Secret Stairs" highlights the charms and quirks of a unique feature of the Los Angeles landscape, and chronicles the geographical, architectural, and historical aspects of the city's staircases, as well as of the neighborhoods in which the steps are located. From strolling through the classic La Loma neighborhood in Pasadena to walking the Sunset Junction Loop in Silver Lake, to taking the Beachwood Canyon hike through Hollywoodland to enjoying the magnificent ocean views from the Castellammare district in Pacific Palisades, "Secret Stairs" takes you on a tour of the staircases all across the City of Angels. The circular walks, rated for duration and difficulty, deliver tales of historic homes and their fascinating inhabitants, bits of unusual local trivia, and stories of the neighborhoods surrounding the stairs. That's where William Faulkner was living when he wrote the screenplay for "To Have and Have Not"; that house was designed by Neutra; over there is a Schindler; that's where Woody Guthrie lived, where Anais Nin died, and where Thelma Todd was murdered . . . Despite the fact that one of these staircases starred in an Oscar-winning short filmLaurel and Hardy's "The Music Box," from 1932these civic treasures have been virtually unknown to most of the city's residents and visitors. Now, "Secret Stairs" puts these hidden stairways back on the map, while introducing urban hikers to exciting new trails all around the city of Los Angeles. Charles Fleming is the author of the national bestseller High Concept: Don Simpson and the Hollywood Culture of Excess, and co-author of the New York Times bestsellers Three Weeks in October: The Manhunt for the Serial Sniper, A Goomba's Guide to Life, and My Lobotomy. A former staff writer for Newsweek, Variety, and the Los Angeles Herald-Examiner, and a frequent contributor to Vanity Fair, the New York Times, the Los Angeles Times, Los Angeles magazine, and LA Weekly, Fleming teaches journalism at USC. He lives with his wife and two daughters in Silver Lake, California.